Miniaturization, the inevitable in consumer electronics, has already caught up with portable video-cassette recorders (VCR’s) introduced just last year [PS, Nov. 78]. Lightweight portables from RCA and Akai are some five pounds lighter and about 45 percent smaller than previous models. New color TV cameras with advanced integrated circuitry are about half the weight of last year’s models. 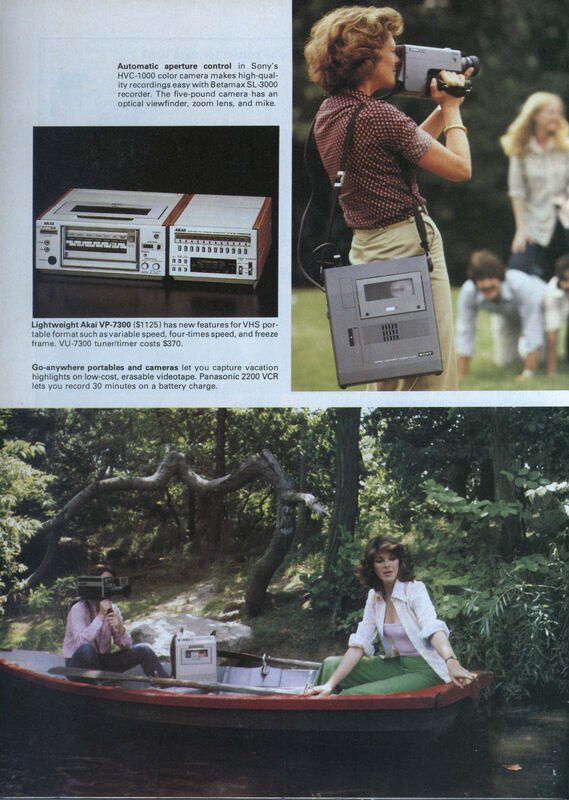 Teamed with a battery-operated color camera, a portable VCR can capture your vacation on tape, help you improve your tennis or golf swings, record action family “albums,” make you a TV-movie director, and serve dozens of other at-home, business, or educational functions. Add an optional tuner/timer module to a portable VCR, and you can tape programs off the air. A second tuner (besides the one in your TV) means you can tape one show while watching another. The combination-portable VCR, color camera, and tuner/timerâ€”costs some $2300. But you’ll save $500 or more over the cost of buying both a portable VCR and a separate AC-only model for home use. Portable VCR’s cost about $1200, tuner/timers about $350, color cameras range from $750 to $1400, and black-and-white cameras are $225 or less. Discounters shave these prices. While portables and tuner/timer modules offer features also available on home (AC-only) VCR’s [PS, Feb.]-freeze-frame, variable speed, programmability demonstrations I have seen of these models also emphasized some limitations. More on that later. Tape versus film Akai America calls its lightweight camera and portable VCR the ActiVideo system. “We strongly believe that the coming decade will see video emerge as the principal format for home movies,” says Jerry Astor, Akai director of video marketing. “With the lightweight color camera and the completely portable ActiVideo recorder, the consumer has all the advantages of a Super 8 film format without any of the disadvantages,” Astor said. One disadvantage with film is that shooting and processing two hours of Super 8 may cost you about $330. A two-hour video-cassette tape, however, costs less than $17. And if you buy a costlier color TV camera with an electronic viewfinder (a miniature picture tube), you can review what you’ve just taped on the spot, erase, and retape the scene if necessary. Akai has been marketing portable video recorders for some time, but ActiVideo is its first VHS-tape-format hardware. One survey indicates that nearly three-quarters of the VCR’s in homes are VHS. The other format, Beta, has been available longer, but RCA’s two-year push of VHS decks that record four hours on a single tape (compared to Beta’s initial two-hour limit) largely accounts for VHS’ success. Firms offering these two formats have now extended record/play time still further (see box). Akai’s ActiVideo bristles with so many new features that a fast-paced demo, like one I saw at an electronics show, is amazing. The VP-7300 ($1125) portable deck has double- and variable-speed playback. There’s also still- and single-frame advance, or still advance at four times normal speed to quickly locate scenes. “Sports fans can play back the action at slow, normal, or fast speeds, or stop completely and freeze the action to determine the moment of truth,” said Chuck Phillips, Akai’s general manager. The deck weighs 15 lbs., and is 11.5 in. wide, 4.8 in. high, and 11.9 in. deep. One drawback is a single tape speed (1.32 ips), so that two hours is the maximum recording time. Longer-playing VHS cassettes that would boost record time may be introduced. A battery charge provides one hour of portable recording. Portables at home Paired with the VU-7300 tuner/timer, the deck can record off the air. The 7300 is also programmable, but unlike some tuner/timer modules that automatically change channels, it’s limited to two programs on one channel each day for one week. One unusual feature is that the battery can take over during brief power failures. Programmed selections won’t be lost and will still be recorded on time. Another new lightweight portable deck with a tuner/timer option is being offered by RCA. Hitachi makes the equipment in Japan, and will market its own slightly altered version, too. RCA’s VHS deck has an LP-mode switch to halve tape speed so you can record four hours on one cassette. The portable RCA VDP150 weighs only 14.3 lbs. ; it’s 4.5 in. high, 10V4 in. wide, and 11% in. deep. The VDP150 records 1-1/2 hours on a battery charge. RCA’s matching TDP1000 tuner/timer can only be set to record a program 24 hours ahead of time. But new accessory components are being introduced so rapidly that, by the time you read this, a programmable tuner/timer module may be available. Most of the other portable VCR’s on the market at this writing are somewhat heavier and bulkier than the Akai and RCA models. Including the battery, most portables weigh 19 to 21 lbs. and are about 12V& in. wide, 5Vz in. high, and 12Vfe to 14 in. deep. The extra weight and bulk shouldn’t be any problem if you carry a machine short distances, or tape from a vehicle with a power adapter plugged into a cigarette lighter. But lugging 21 lbs. plus a TV camera any great distance can be a strain. Some of these bigger models, such as the Panasonic PV2100, PV2200, and similar Quasar models, record only 30 minutes on a battery charge. 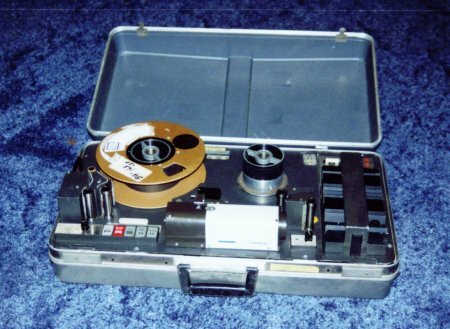 Magnavox says its portable can record up to 80 minutes, since its TV camera has a separate built-in battery. For use at home with an optional tuner/timer, one advantage some of these bigger models have is seven-day-programming capability. Several modules are available with either mechanical or varactor (all-electronic) tuners. J.C. Penney and Magnavox are two firms offering programmable modules that can automatically tune in and record different channels you preset up to a week ahead. The modules are paired with two/four-hour VHS portable decks. Trim color cameras Shrinking more and more recorder-circuit functions onto tiny microcircuits not only helps miniaturize portables, but it makes color TV more compactâ€”almost like small Super 8 film cameras. JVC, for example, has two models (see photo) that weigh only 3.1 and 3.3 lbs. The heart of these cameras is a %-in. Vidicon tube that has a built-in color-stripe filter. By putting 90 percent of the electronic functions into integrated circuits, JVC cut the number of components to less than half that in most single-tube color-TV cameras. Both of JVC’s lightweights have through-the-lens optical viewfinders, as does the 3.2-lb. model Akai introduced with its new portable deck. You’ll have to take along a portable TV if you want to review what you’ve taped in the field. All three models also have zoom lenses and automatic iris control. Video and audio output signals are compatible between VCR brands, but cable connections may not be. Cameras have a pistol-grip push-button control to start or stop (pause) camera operation; this is one of several input connections that can differ between VCR decks. New ultrasensitive color cameras will operate with only 10 foot-candles. You’ll first have to set a camera switch for color temperature: indoors, outdoors, or low light (morning or evening). Then put your portable VCR in RECORD, press the camera-start button, and tape as long as you like-without worrying about costly film development. Home VCR’s get new features. Video-cassette recorders equipped for home use (AC only) are evolving with incredible speed. The latest models, equipped with microprocessor-based convenience features and extra-long play, trim tape cost per hour and simplify recording. JVC, which has stuck with single-speed (1.31 ips) VHS recorders capable of two-hour recording, now offers the HR-6700U. This new deck has a second speed (0.43 ips) that captures six hours of programming on a two-hour T-120 cassette. JVC uses separate sets of recording heads for each speed to maintain high picture quality. The deck’s microcomputer-controlled programmable timer lets you automatically record six different programs on different channels while you’re away for a week. A remote control can select playback at double speed, slow motion, or freeze frame. Sharp’s new $1395 VC-6800 can also tape up to six hours with a two-hour VHS cassette. Its computerized tuner can be set for seven channels and programs over seven days. A backup battery takes over timing functions if AC power fails. Sharp’s Automatic Program Locate Device (APLD) puts signals on the tape so up to 99 locations can be quickly spotted by fast scanning in either forward or reverse. Several Beta-format decks, until now limited to three hours maximum recording with L-750’s, now have a slower speed that permits 4-1/2 hours on these cassettes, and five hours on the L-830 cassette planned for introduction. BetaScan is a new feature added to Sony’s SL-5400 and SL-5600 recorders. It allows you to locate sections by viewing pictures as the deck runs the tape rapidly in forward or reverse. Sanyo’s $1495 VCR5500 is another Beta-format deck that now has 4-1/2-hour recording capability. It also features seven-day preprogramming (five shows), and remote control for fast search in forward or reverse, variable-speed slow motion, and stop action. Panasonic and Quasar have also updated their two/four-hour VHS machines to the newer two/six-hour format. Although the VHS and Beta tape formats seem to be firmly established, other systems are on the way [see “Look and Listen,” this issue]. Portable VTRs were around for quite some time before that. I can remember the first time I went to Disney World there were several people using the type of video recorders as are pictured on page 3. 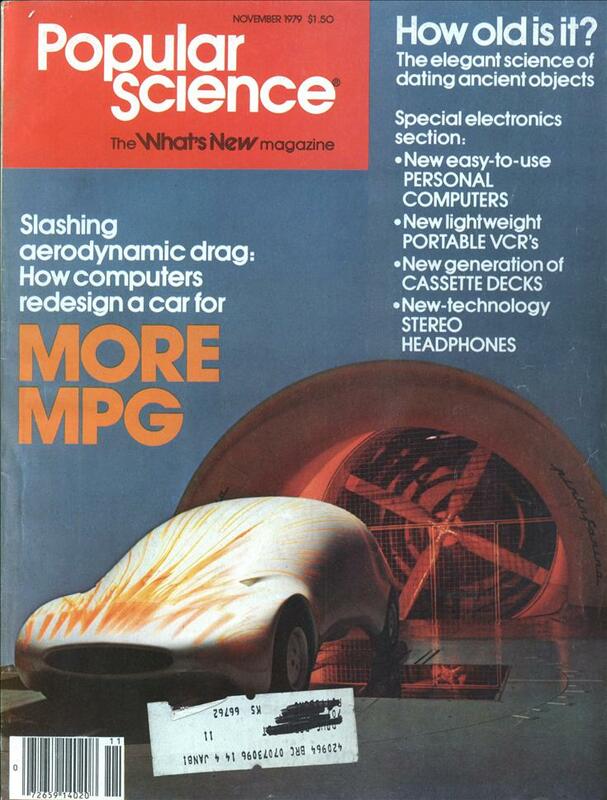 Even then I remember thinking that it seemed rather bulky and inconvenient. My first VCR was the JVC HR-6700U, which I bought in late 1979 or early 1980. At the time, an Apple colleague had a contact in the consumer-electronics industry. Several of us Apple guys bartered Apple equipment for VCRs. I also got some stereo speakers that way. The 6700U had a fully-electronic tuner as opposed to the turn-knob ones common at the time. The user could therefore tune any of the 16 (20?) tuning buttons to any channel; you didn’t have to accept all existing channels, just the ones you cared about. Also, the tuning was by means of small knobs for each “slot.” We were able to tune the TV cable “mid-band” between channels 6 and 7, to pick up additional channels. Those channels were not normally available without paying for a fancier cable box. The digital timer allowed two-week advance programming, but didn’t support “all-weekday” programs. You could do, e.g. every Thursday or all seven days, but not Mon-Fri.
Now here’s a funny anecdote. Andy Hertzfeld, later of Macintosh fame, was one of my colleagues at Apple at the time. His 6700U developed a clock problem: it ran exactly four times faster than real time. As engineers, we all knew that some divider chip had failed. But Andy didn’t want to part with the unit and wait for warranty service. Being a resourceful software engineer, he simply wrote a program on the Apple ][. He entered the date/time of the desired TV program, then the current clock reading—which could be almost any “random” day/hour/minute. The program then told him what to set for the recording, having computed where the VCR’s overspeed clock would be when the program aired. Woz later mentioned that the 4000-foot film reels wouldn’t fit the 3000-foot tables on the transfer machine, so they spent extra time cutting the print into sections that would fit, then spliced it back into its original form. Film companies, however, are very cautious that nobody steals frames from a film, lest they be printed into illegal still photos. The prints were examined to detect frame-stealing. Woz never asked whether the splices got the projectionist into any trouble; an occasional splice could be due to a film break, but not several at regular intervals. WOW I ended up with one of those copy’s of “the Empire strikes back” back then. I always wondered how it was made and who made it. There should not be an apostrophe in “VCR’s”. This spelling indicates either possession (as in “the VCR’s clock”) or a contraction of two words into one (as in “the VCR’s obsolete”). An apostrophe can also be used to write a shorter spelling of a longer word, but that is not applicable in this case. captain nitpick: I agree, it is a very odd use of an apostrophe. This reminds me of “VCR repair guy” from the MadTV sketch. I got a two piece portable VCR in 1985. You can see the recorder at 01:32.